Air Fryer vs Convection Oven – What’s the Difference ? Air Fryer vs Convection Oven what's the difference and which one is right for your kitchen counter top? If you are looking for a healthier way to cook your food that doesn't involve lots of fatty oil then you have probably looked at either an air fryer or a convection oven. Both will give you the ability to ​cook foods with a small coating of oil and thus help reduce the amount of fat that you use. But Which should you buy ? If you are in a rush and don't have time to read the rest of the article then in our opinion a convection oven is the one to get. Air fryers can be extremely finicky when it comes to getting the temperature, cooking times and the amount of oil you may have to toss your food in first(if it needs it). For some dishes a lot of experimentation is required to get the perfect ​blend between cooked thoroughly and too crispy. What is an Air Fryer​ ? Despite what the name suggests an air fryer is not actually a fryer in the traditional sense. There is no oil well that contains heated oil. Instead it forces hot air down through the food basket from above. Because you are not "frying" in the traditional sense air fryer champions will always be quick to point out that food that is cooked in an air fryer will be considerably healthier than in a traditional fryer. With a normal oil based fryer some of the oil will always be absorbed by the food as it is being cooked. This means that your food will have a much larger fat content than normal. With an air fryer you will have the added health bonus of reduced fat, however that bonus will be at the expense of taste i.e it will never be so good as deep fried. How does an air fryer work ? As mentioned above an air fryer works by forcing hot air down from above and onto the food that is usually contained in a basket. It has a powerful fan mounted above a heating element. The air is then force downwards over the heating element and then onto the food below. The food is usually in a basket similar to what you might find in a traditional fryer. The basket is always located at the bottom of the air fryer. ​However as you can see in the above video you can still get some pretty decent results from one provided you know what you are doing. 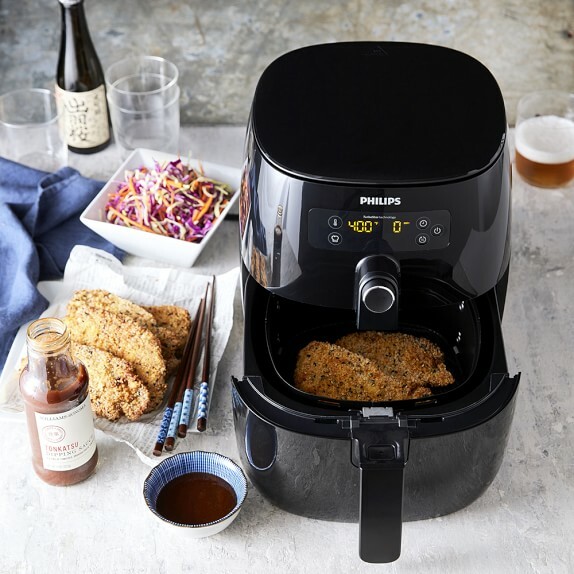 An air fryer is works on the exact same principle as a convection oven, a fan is used to circulate the hot air around the food to give an even distribution on heat. The real difference between an air fryer and a convection oven is the the air fryer has a basket that is located at the bottom of the fryer and hot air is forced down from above. Whereas a convection oven is more like a traditional oven plus a fan. With a convection﻿ oven the heating elements can be placed on the top, bottom and side walls of the cooker and a fan is used to circulate the air normally from the back wall. ​Convection ovens have one major advantage in terms of the types of food that they can cook. Pizza and toast. Because of their shape. An fryer is usually round and has a very limited size to the basket. However, a convection oven is the usual rectangular shape that has the ability to take fairly large pizza. The Philips Digital Airfryer packs a lot of features into a small compliance that fits easily on your counter top. It has a 1.8 pound maximum capacity so is best suited to couples or a small family. There is a double layer rack supplied so you can separate out different ingredients that may require different cooking times. ​It has an automatic shut-off, once the cooking cycle is finished it switches off the heat. Although if the food is left in there for a lengthy period it will continue to cook. The Philips Airfryer has a specially designed cool wall exterior. Despite the high internal temperature the exterior of the fryer will remain cool to the touch so there is no risk of burning yourself. It has a fairly small size and does not take up a lot of room on a counter top. This also makes it very easy to store if you wish to remove it once the cooking is complete. The Smart Oven from Breville is both convection oven and toaster oven all wrapped into one unit. Each setting automatically adjusts the each of the five heating elements(three top and two bottom) plus the fan speed to suit the particular dish you are making. For example baking requires that there is an even temperature all around so the heat is programmed to be evenly distributed and the fan is used to ensure there are no cool spots throughout the interior of the oven. For broiling more heat is applied from the top down onto the dish to help give it that seared effect. What is the difference between an Air Fryer and a Convection Oven ? Given that they both work off of the exact same principle i.e hot air the real difference is in what they can cook. Air Fryer or Convection Oven which should you buy​ ? As stated earlier we would definetly see the convection oven as the better long term investment for your kitchen. You can achieve a lot more with the oven than with an air fryer. ​And for the majority of people you will also get much better results. « Keurig K10 vs K15 – What’s the Difference ?